Students come back to school in January to new classes and a new opportunity for a fresh start. And this year, we also came back to school with a new drink option in the Dowling Catholic cafeteria. This option, of course, being Hydrive. Hydrive is a non carbonated “energy water”. It advertises all natural flavors with caffeine and vitamins. They “care a lot about hydration that energizes.” And yes, you could definitely say that it energizes. Coming in with a whopping 80 mg of caffeine per serving, and keep in mind there are two servings per bottle, Hydrive has the same amount of caffeine as a 16 oz Monster. Or an entire can of Diet Mountain Dew has 105 less milligrams as a full bottle of Hydrive. These drinks have caused some controversy around the school. 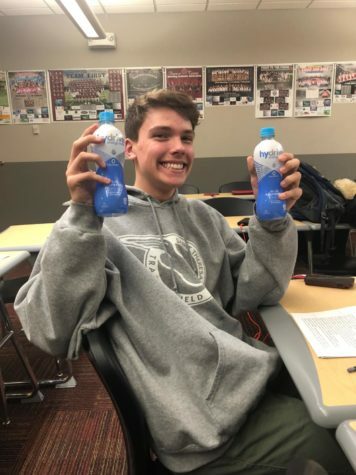 Some teachers are enraged about the new drinks because of the caffeine content, while many students seem to be happy about Hydrive because it keeps them awake. Some people have taken their love just a little bit too far. Senior Will Donaghy had a minor incident with Hydrive, which ended with him going to the nurse to get his heart rate checked because his body was shaking. His caffeine amount was at about 470 mg. Keep in mind the daily limit should be 400. And Donaghy had had this amount in the span of about five hours, without realizing it. So please, when considering what drink to get with your lunch, know the effects that Hydrive could have on you.